A rare drawing of comic book adventurer Tintin has sold for 9.6 million Hong Kong dollars ($1.2m) at an auction in Hong Kong. 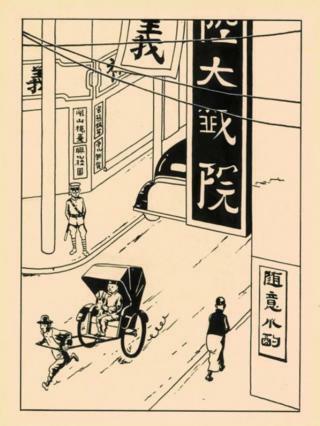 The drawing, by Belgian cartoonist Herge, is from his book The Blue Lotus, set in Shanghai. French auction house Artcurial organised the auction. They said the work was the only original from the book still in private hands, and had been bought by an Asian collector. "The Blue Lotus is considered by specialists as the masterpiece album of Herge," said Eric Leroy, Artcurial's expert in comics. "It was also unusual to talk about China in the thirties in Europe," he added. The auction house also facilitated the record-breaking sale of a hand-drawn Tintin In America cover for 2.65 million euros (about $3m) including fees - 1.3m euros without - in Paris in May. #BBCtrending radio: Why is Tintin trending in Indonesia?